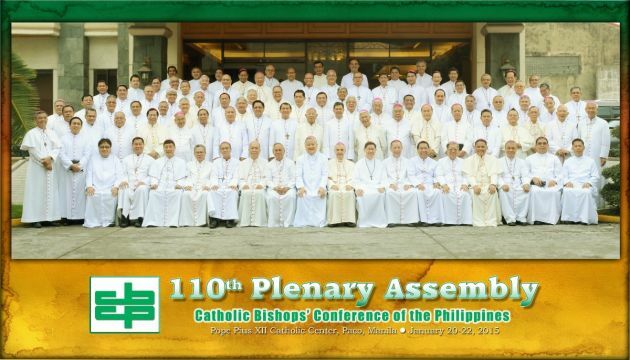 (Photo: Catholic Bishops' Conference of the Philippines)Philippines Catholic Bishops on January 20, 2015. The new Philippines President Rodrigo Duterte has been a loggerheads with them and now the bishops are taking aim at him for extra-judicial killings taking place on his watch. At least 30 "drug dealers" have been killed since Rodrigo Duterte was sworn in as the president of Philippines, police say, triggering the wrath of human rights activists and the fears of the country's Catholic bishops. The police also announced the seizure of nearly $20 million worth of narcotics, since Duterte was sworn in June 30, International Business Times reported July 5. The former mayor of Davao city, Duterte is known as "the punisher," and won the election in May pledging to crush crime. However, his advocacy of extrajudicial killings has alarmed many. After his oath taking, Duterte said he wanted to get rid of drug traffickers, telling supporters to "go ahead and kill them yourself as getting their parents to do it would be too painful." In the past, he has also offered rewards to those who "shoot" them. The secretary-general of the National Union of People's Lawyers, Edre Olalia said in a statement July 4 that the murder of suspected drug dealers is not a "quick fix" to the problem, Newsweek reported. "Let us be crystal clear: the drug menace must stop," said Olalia. "Yet the apparent serial summary executions of alleged street drug users or petty drug lords which appear sudden, too contrived and predictable must also stop. The two are not incompatible." On July 6, Duterte publicly accused five police generals of involvement in the drugs trade and said only he would be accountable for a bloody crackdown that has killed 30 people since he took office last week, Reuters reports. The president named the generals during a televised speech and said they were protecting drugs syndicates and contributing to a "deterioration of law and order" that he would fight to reverse, with no remorse for the consequences. "It's going to be a dirty fight, it's going to be a bloody fight. I am not apologizing for it," Duterte said. "As public authority, mine and mine alone, I assume full legal responsibility for it." The Catholic Bishops of the Philippines had on June 20 expressed alarm at signs of vigilantism and a sharp rise in police killings, following the May general election. In a statement, the bishops expressed alarm at reports that suspected drug pushers have been shot dead because they resisted arrest. "We are disturbed by an increasing number of reports that suspected drug-peddlers, pushers and others ... have been shot, supposedly because they resist arrest," Archbishop Socrates Villegas, the head of the conference, said in a statement. He was responding to national police figures showing that 29 drug suspects were shot dead between May 9 and June 15, compared to 39 killed in the previous four months of this year. They cited reports that bodies have been paraded for the media with labels declaring their supposed crime. The bishops also condemned the offering of financial bonuses to police who kill. They said such bounties are never morally acceptable. The statement was a pastoral message addressed to Philippine law enforcers, but could fall on deaf ears as bishops and priests have been the subject of what Vatican Radio called "obscenity-laden attacks" from Duterte. He has also referred to Pope Francis and the Philippine bishops as "sons of whores", and said the Church is "the most hypocritical institution," the Catholic Herald has reported.